The first development which has to be pointed out is the fact that the total sales of the world’s top 100 arms producing companies are quite stable. They have gone down a bit over the past two years, but not that much. We are also seeing a more regional, or more national development – and one of them is very clear: Russian companies have seen a very steep increase in their total sales. So, the companies in the top 100 based in Russia have increased their revenues from 2013 to 2014 by almost 50 percent. That is a very significant change. By contrast, there was a fall in revenues of companies in the US and western Europe. Of course, that´s not the only important development. If we look to Europe, we see that the crisis in Ukraine does very much the same for companies in Germany. The crisis in Ukraine is probably much more important than what happens in the Middle East because it sets in motion a process where the German government is now looking at increasing its own military budget. The German government is the most important client for the German arms industry. And this is true for the arms industry in general. Companies are primarily looking at their own governemnts as the first and foremost clients. 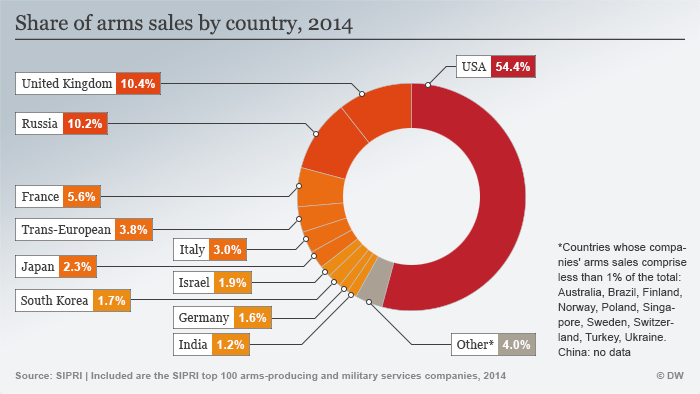 In Germany, there are a few companies solely involved in arms production, or have an important arms production segment within their total sales package. And there are two firms, that have seen their arms sales – as part of their total sales – increase quite a lot over the past few years. These are Thyssen-Krupp, which makes ships and submarines, and Rheinmetall, which focuses on land-based systems. Thyssen-Krupp has been particularly successfull selling submarines. Submarines are sold to Israel, South Korea, Turkey, Greece – and that´s where they are the world leader. They also supply naval equipment to the German Navy. so that is where they have been particularly successfull. The problem with arms sales is that they depend on a few major contracts. You get a major contract, you fill that. And then there is a gap. And so sales drop for a while. But then they can go up again. A good example is Krauss-Maffay-Wegmann, a tank producer in Germany. It had very high sales around 2008 and now they have dropped to a level which is less than half to what is was in 2008. In 2008, they happened to have two major contracts for the sale of Leopard II tanks to Spain and Greece. But now, there is a new contract, signed two years ago, for the sale of tanks to Qatar. 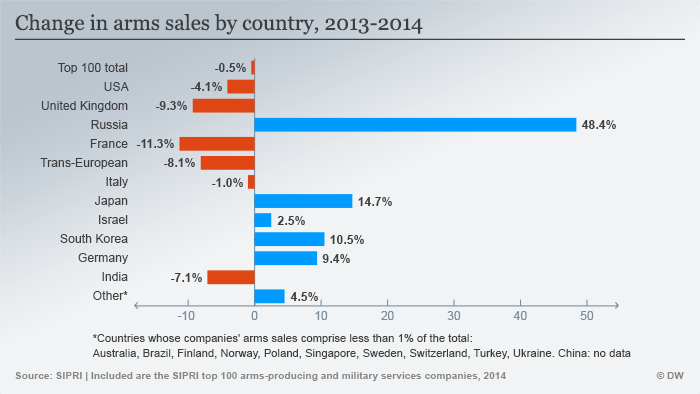 So it may very well be that next year we see quite a strong increase in arms sales at Krauss-Maffay-Wegmann.